New president of Botswana Mokgweetsi Masisi. The appointment of new Director General of the Directorate on Intelligence and Security, Peter Magosi to replace the deposed Isaac Kgosi has sparked widespread mixed reactions from the general public. 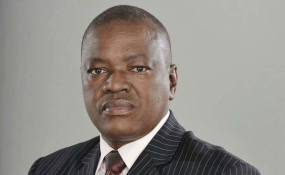 Many have been showering incoming President Mokgweetsi Masisi with praise for the bold decision to fire the 'most feared man' in the land after the DIS gained a reputation for notoriety, following a spate of extra judicial killings, unlawful arrests and unexplained disappearance of suspects compounded by unaccountability and flagrant abuse of state resources. The DIS had become a law unto itself, confirmed when Kgosi boldly declared before a Parliamentary Public Accounts Committee (PAC) that as the spy chief he is the accounting officer and does not report to anyone on issues of operations, let alone the President. That declaration was the deal breaker, the last straw that broke the camel's back so to speak in figurative speech. Now reduced to an ordinary citizen, many believe that the purge on Kgosi has opened floodgates, exposing him to investigations and litigation particularly from the Directorate on Corruption and Economic Crime (DCEC). Many have argued that there was wanton abuse of power by the DIS under Kgosi's watch, leading to frequent accusations of infringing on the rights and freedoms of citizens, amounting to criminal conduct. To cap it all, the spy chief and his agents have been living like rock stars, which raised eyebrows about such acquisitions bordering on living beyond their means. And for that they want Kgosi investigated and prosecuted. Responding to fears that the much publicised dismissal of Kgosi could be a smokescreen to cover redeployment to a plum post, Government has been quick to clear the air by announcing that he has not been given a diplomatic post. The public awaits, with bated breath to see if that will come to pass as there is growing speculation that a gentleman's agreement may have been entered into between the parties. "I can confirm that there is no truth to said stories that the former Director General of the Directorate on Intelligence and Security, Colonel Isaac Kgosi, has been given a diplomatic post," said Permanent Secretary to the President Carter Morupisi, dismissing claims circulating on Social Media that Government has appointed Kgosi Ambassador to Germany after the post recently fell vacant after the passing of Ambassador Tswelelopele Moremi. As he settles into the new position as head of state, Masisi is expected to continue making drastic changes, purging the deadwood from the Khama administration while redeploying civil servants critical to the implementation of his road map going forward. Many that were rewarded for loyalty, bootlicking and sycophancy are already shaking in their seats due to the uncertainty brought by sweeping waves of change under the Masisi regime. By the end of the week there was speculation that one Specially Elected MP will soon resign from Parliament to take up appointment as Ambassador to the United Kingdom to replace Roy Blackbeard. The latter has been Ambassador to the UK since 1998 where he was deployed after relinquishing his post as Serowe North MP to pave the way for Ian Khama to join active politics. Khama's presidential term ended on March 31, 2018. In yet another critical change of guard in the Ministry of State President - Defence, Justice and Security, Masisi will soon announce a replacement for Colonel Silas Motlalekgosi in the position of Commissioner of Prisons and Rehabilitation as the contract of the latter comes to an end. Still in the same ministry, the removal of Kgosi follows shortly the appointment of Justice Terrence Rannowane as the new Chief Justice replacing Maruping Dibotelo who has retired. Still at the Office of the President, a recent reshuffle of senior Government officials saw Elias Magosi replace Botshelo Mathuba as Deputy Permanent Secretary to the President. Magosi, who left the public service under a cloud of controversy following a fall-out with his boss - the Minister of Environment, Wildlife and Tourism Tshekedi Khama - returned in the higher post at OP after Mathuba, who had been the Deputy PSP since 2014, was redeployed. The termination of the contract of the Director General of the DIS, and his replacement by a former colleague at Botswana Defence Force (BDF) has in some quarters sparked fear that it only amounts to changing faces. There is a school of thought that weaknesses are in the law establishing the DIS as an institution, like many others e.g. Ombudsman, as opposed to the individual at the helm. Although many are adamant that DIS operatives abused their powers under him, others observe that Kgosi may well have been enjoying excesses granted to him by the law or specifically the appointing authority - President Ian Khama. The two had been squadrons at SSKB barracks, before re-uniting at OP as the two most powerful men in the country. Although the contractual terms and conditions which Khama had solely determined (without the input of a DIS Council) remain a secret, it is not far-fetched to assume that they protected each other like buddies. Section 6 of the Intelligence and Security Service Act reads thus: "Director General (1) There shall be a Director General who shall be appointed by the President on such terms and conditions as the President may, on the recommendation of the Council, determine. (2) The Director General shall be responsible for the direction, control, administration and expenditure of the Directorate." The terror unleashed on citizens and politicians by DIS convinced citizens that they have unlimited powers. Others believe that Kgosi was a mere messenger who abused power under the cover of 'national security' even when such was not the case. Many, including the media have been challenged to scrutinise Magosi to see what reforms he would bring to an institution that had gone rogue under the tutelage of Kgosi. The jury is still out on what he will do next. The new spy chief will do himself a lot of justice to lift the veil of secrecy allegedly covered by national security concerns. The media is also entitled, on behalf of the public, to know such terms and conditions as they relate to the incoming Director General. A blanket ban on the altar of national security would not be permitted under section 12 of the Constitution. "It was frightening that the outgoing Director General thought he was not accountable to any person or body despite the functions of the Intelligence and Security Council under Section 30 of the Act and Parliament through its Parliamentary Committee on Intelligence Security under Section 38 of the same Act. The obligation to accountability cannot be arrogantly and conveniently be tossed aside by a person who simply feels that he is above reproach," said attorney Tshiamo Rantao. On the political front, Masisi has given many renewed hope, but his wave of reforms have done little to deflate scepticism from some quarters. There is a school of thought that although the president has state resources at his disposal to reward disgruntlement within his party, the BDP remains a vulnerable and fragile party. It is argued that Masisi's strategy of overlooking party loyalists for returnees and opposition recruits will certainly cause internal panic. The opposition, however, cannot readily benefit from such instability because it does not have the luxury of state resources to either reward the possible arrivalists or calm its own loyalists. The battle ground therefore will eventually be on policies, the issues, credibility and integrity. Turbulences are a common phenomenon in political domain. Those that have closely interacted with Masisi say the man is alive to the fact that his benevolence could trigger a backlash from BDP loyalists, who have developed a sense of entitlement. He, however, remains unwavering in implementation of reforms be believes will bring change notwithstanding the simmering undercurrents that are calculated to derail his recruitment and reward antics. For him, it is easily about addressing those concerns that the public has been raising about Khama's administration which resulted with the party splitting for the first time leading to the formation of the Botswana Movement for Democracy (BMD). Those that walked away protested the hard-line stand under Khama's administration that allowed little room for debate and robust engagement in the party. In a move that will endear him to citizens, particularly unemployed masses, but will certainly disappoint the World Bank, Masisi has promised to open up 7 000 posts in the civil service to employ more graduates. The World Bank has repeatedly advised Botswana to consider reducing the bludgeoning civil service to cut its wage bill, as a cost cutting measure to reduce spending. Copyright © 2018 The Patriot. All rights reserved. Distributed by AllAfrica Global Media (allAfrica.com). To contact the copyright holder directly for corrections — or for permission to republish or make other authorized use of this material, click here.